When Katie Doak took to Facebook to find her biological family, she had no idea that her half-sister was trying to find her too. The Phoenix, Arizona, teen was adopted at 18 months old when her mother was unable to care for her. 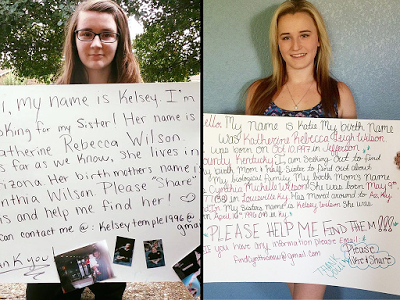 With help from her adoptive mother, the 17-year-old girl began searching for her birth mother and half-sister, Kelsey Wilson, 19. On Monday, Doak took her search to Facebook, posting a photo of herself holding a sign that included everything she knew about her birth mother and half-sister (who was raised by grandparents). A local news outlet, 12 News, saw the post and interviewed Doak. Hours after the news story was shared on Facebook, an individual messaged Doak with her half-sister’s contact information. After messaging her long-lost sister on Facebook, she began looking through her online photos and discovered that Wilson had been looking for her too. The two sisters reconnected by phone on Wednesday night. After connecting with Wilson, Doak discovered she has five more siblings who have either been adopted or are living with her biological grandparents and aunt. She says she plans to meet them all.